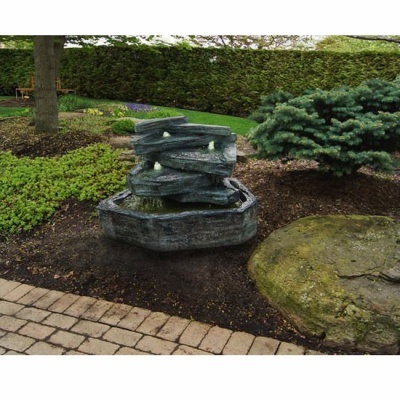 Henri Studio Slate Springs Water Feature promises an inspired outdoor garden fountain that has been hand finished by renown Henri sculptors. 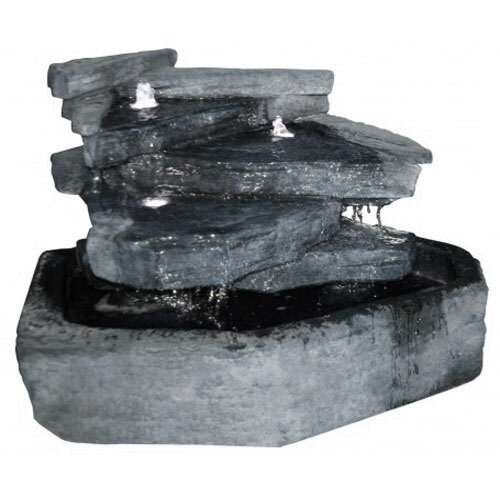 Slate Springs fountain creates a naturalised focal centrepoint feature with it's unique Relic Lava distinguished finish. Henri Studio use top quality cast stone to sculptor this waterfall influenced by natural Welsh slate hills, where rainwater rolls down over the dark grey slate shelves. LED lighting is added to compliment this effect, shimmering through the water during daylight or night time. Water erupts in pools to add height to the slate shelf water falling throughout. A self contained re-circulating pump (included) ensures water is recycled from top to bottom ensuring no mains water plumbing is required. Constructed from genuine cast stone which is durable and weather resistant. Weighing 158kg the Slate Springs feature requires a fixed and well situated footing such as a patio position.